Guillows profile U-control for beginner with fuel, filter bulb, battery, U-Reely handle; .23 power. Ultimate in radio control is Mustang by Phil Breitling. Spans 5-1/2'; "full house" equipment. Plans used by 1961 R/C scale winner. "FAI Class" free flight (left) for inter­national events has Cox .15 power. 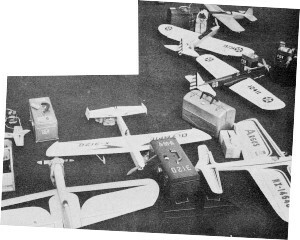 Collection of top aerobatic Ukie stunt planes was snapped at '61 Nats. Majority of these have, or will appear in American Modeler. Models have no landing gear and take off from a dolly made of steel wire fitted with 3 or 4 model wheels. When model flies out of dolly cradle latter rolls out of flying circle. Fuselage bottoms have skids on bottom for landing. 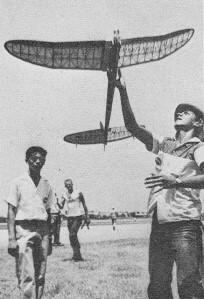 To maintain equal diameter flight circles and to prevent model being whipped to higher speeds, the flyer holds his control handle in a revolving yoke atop a pylon pipe mounted in circle's center. Flyer has to step lively around pylon to keep up with his model! Flying is strictly against the stopwatch, three timers being utilized during competition flying. Big boost to control line speed has been via Victor Stanzel's Mono-Line control system. Unlike the two-wire, bellcrank system popularized by Jim Walker, the Mono-Line utilizes a single wire from handle to model. The control handle twists the wire along its length, this twisting action turns a cam linked to a small crank in model. Crank moves elevator push rod. Mono-Line has the advantage of somewhat reduced wire drag because of single wire. Control is smoother and finer and works even when line slacks off, should model turn into the circle because of wind or instability. Recent addition to the speed event schedule is Proto Speed. Class B engines only are allowed and model requirements are quite different than for standard speed types. Design must resemble a full scale airplane, have engines enclosed, have minimum wing span of 24 in. and have working landing gear. Model must take off on its gear; flying is from a pylon as in regular speed. Fourteen laps are timed; current speeds range up to 120 mph. C/L JET SPEED - At present there are only a few practical jet engines available to modelers. Of these, the powerful Dyna-Jet has gained the most popularity. "Popularity" is only a relative term. Although the Dyna-Jet has excellent performance, starts easily, is cheap to operate (straight gasoline for fuel) it does have two shortcomings. It emits an unearthly roar when running and gives off a great amount of heat. These qualities are inherent in the operation of such an engine and limit its use as a model power plant. The noise factor presents the most difficult problem, because the minute you fire up a Dyna-Jet near a residential area the police may appear within minutes. "Cut it out son, you've set all the dogs to barking and baby's a'crying and the neighbors are complaining mightily!" So Dyna-Jets can only be flown where their noise is not objectionable. 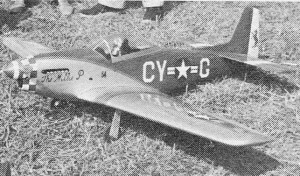 The Dyna-Jet is a scaled-down, simplified version of the pulse jet used to power the German V-I Buzz bombs of World War II. It is nearly two feet long, has only one moving part, the intake valves, burns straight gas and delivers 4-1/2 plus pounds of static thrust. Starting is with an air blast from a tire pump and spark coil ignition to light off fuel mixture. Both are disconnected after engine starts, it will continue to run by itself until fuel is exhausted. Its main use with models is in the Jet speed event. It is also used to power big scale models of jet fighters, but requires careful insulation and ventilation to prevent fires. On speed models the engine is mounted externally above the model airframe usually completely exposed so that neat carries away in the air. Jet speed model construction is rugged like prop speed jobs and size is close to Class C types-about 20" wing span. All the rules for regular speed flying apply. Flying is done on 70 ft. lines only. Take-off dollies are seldom used. Since there is no prop in the way, model can slide off on its belly. Present jet speed record is 179 plus mph, This figure has not been approached for several years, speeds of 150 to 160 mph being usual in competition today. This compares favorably with Class C prop-driven model speeds. C/L ENDURANCE - Strictly in the fad or exhibition category, control line endurance flying has a limited appeal to most modelers. 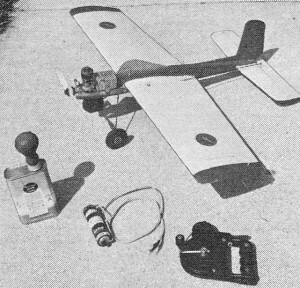 Early endurance attempts were made with large stunt planes or converted radio control types fitted with fuel tanks holding many quarts of fuel. Hours and hours of flying proved that the flyer would wear out before the engine or the model, a fine tribute to the engine makers, One major problem was the accumulation of oil from engine exhaust which gummed up controls, soaked through covering and weakened model structures. Some models then collapsed in flight. All-out attempts to boost records turned up some interesting gadgets. One system used a standard size fuel tank in the model which was constantly refilled through plastic tubing running along flying lines to a reservoir at center of circle. Reservoir was fitted with a hand pump to push fuel through tubing out to model tank. Such all out man-and-model-killing endurance tests have since been eclipsed and sane rules for such events have been written into the A.M.A. regulations, Engine size is limited to .19 to .36 cu. in., flying lines must be 52'h to 70 ft. in length. Models must be heavier-than-air type, no Helium gas bags please, and take-off weight is limited to 4 pounds including fuel. Permanent landing gear must be used and no model parts can be jettisoned during flight. C/L RAT RACING - The "stock car racing" of model flying, Rat Racing is a favorite among both contest and weekend yo-yo flyers. 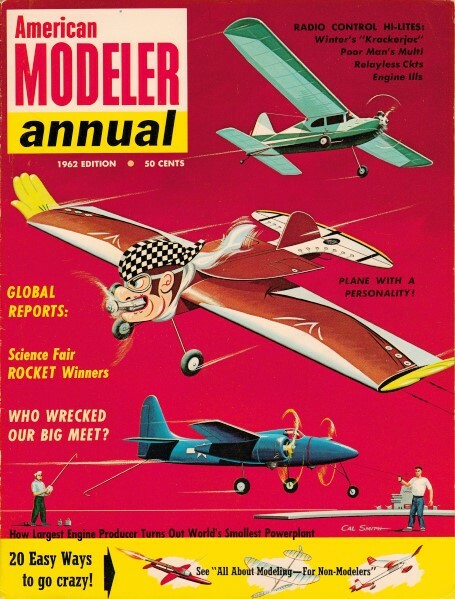 The idea of putting several models into the air in the same circle and tail chasing in a plain old-fashioned race increases the fun factor to a high degree. Rat Race flying has grown out of the desire to simplify Team Racing rules. This colorful T.R. event has never gained the widespread popularity it deserves, possibly because it is complicated. Rat Racing, on the other hand, uses models reduced to the bare essentials. There are no restrictions on model design except that fixed landing gear is required, models must be rigged for counter-clockwise flight, must R.O.G. and have engines from .15 to .40 cu. in. displacement. The typical Rat Racer is a rugged compromise of speed job, team racer and profile trainer types. Speeds of over 100 mph have been reached in some racing, so models must be strongly built. Model size varies from about 20 to 30 in. wing span. Somewhat larger than a similarly powered speed job, the Rat Racer requires extra wing area and length for reasonable maneuverability and good landing and take off handling. Simplicity keynotes rat racer construction. There is plenty of hardwood and plywood used in construction: Profile or boxed in crutch fuselages are favored. Wings and tails are usually solid bass and/or balsa. Thin lifting airfoils are used.